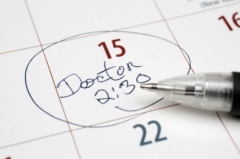 We have a wide range of appointment times available for both doctors and practice nurses. However, on certain days, the doctors run specialist clinics or see patients with long term conditions for reviews. We keep the balance of appointments under review so that we can endeavour to meet the needs of all patients. Many problems concerning advice can be dealt with over the phone and it may be more convenient for the doctor or nurse to telephone you. If you think this is appropriate please advise reception staff when you call. It might not be your usual GP who will contact you. We will always deal with urgent requests that day. If clinics are already fully booked, and you do not feel that your problem will wait until the next available routine appointment, the receptionist will arrange for a doctor to telephone you to discuss the most appropriate way of managing your request. If you need an appointment with a nurse, please inform the receptionist of the type of appointment required, (e.g. blood test, ear syringing, cervical smear, travel vaccine, dressing, blood pressure monitoring, new patient medical etc.) so that adequate time can be made available. We have a phlebotomist who is specially trained to perform blood tests. GP appointments are routinely set at 10 minutes and nurse appointments at 7 minutes. If you feel you need more time please mention this to the receptionist when making the appointment.